A recent news release from the Veterinary Health Center at Kansas State University advises pet owners to give their dogs and cats heartworm pills year-round, even in the cold winter months. Heartworms (Dirofilaria immitis) are nematodes that are spread from one pet to another by mosquitoes. The role of the mosquito has led many pet owners to mistakenly believe that heartworm pills are not beneficial during the winter months when their pets are not exposed to the insects. I used to make that mistake myself, until my veterinarian told me that the pills protect pets against more than just heartworms — there are many other types of harmful nematodes out there, and many of them do not rely on mosquitoes for transportation. Roundworms, tapeworms, hookworms, and whipworms can also be dangerous, and some can even infect humans. Unlike heartworms, they are not spread by mosquitoes. Instead, they are found in rodents and the feces of infected animals. Pets that eat infected rodents or feces are in danger of infection. 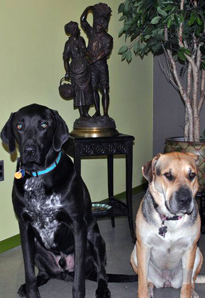 Loki and Abbie, pictured here at ESA headquarters in front of a statue given to C.V. Riley by the government of France, now get heartworm pills all year round. However, the good news is that the pills we give our pets for heartworms can also prevent them from being infected with these other nasty nematodes. The label on my dogs’ heartworm pills says that in addition to heartworm prevention, the pills are also good for the treatment and control of ascarids (Toxocara canis, Toxascaris leonina) and hookworms (Ancylostoma caninum, Uncinaria stenocephala, Ancylostoma braziliense). “We really want to preach prevention for our pets because it’s so much easier and so much cheaper for them, especially since treatment is hard on them,” said Susan Nelson, a clinical associate professor at KSU. While it may be tempting to save a few bucks in the winter months when there are no mosquitoes around, be aware that there are other nasty nematodes out there, and heartworm pills can help to prevent your pets from being infected by them. I believe this article contains huge valuable information for pet lovers. This article can help by preventing any kind of risk. Truly its a great job posting this kind of staff. Thanks for sharing with us. Widespread, prophylactic use of any anthelmintic is a recipe for resistance! The same can be said for insecticides and acaricides. A more sensible strategy, central to IPM, is to monitor prevalence and intervene only when doing so is warranted by economics or other considerations. In the case of heartworm, where vectors are inactive during several months in northern latitudes (at least), the expense and selection pressures from year-round treatments do not make sense. This issue would be a good one for student debates in Portland, 2014.